This is an easy summit to get to. Can get there from Falls City but its is easier to come in from highway 410 near Logsden. Use Big Rock Creek Road to access. This is also on private timber land and is closed during fire season. I will upload a google track in the download section for help. The name came from the summit area. The summit is in dense forest and during activation Mosqutio's were horrible and we forgot repellent. Needless to say we were in a hurry to collect chasers. Thanks to all the chasers that came to my aid. You can drive within 800ft of the summit with about 100ft elevation gain up a cat road. 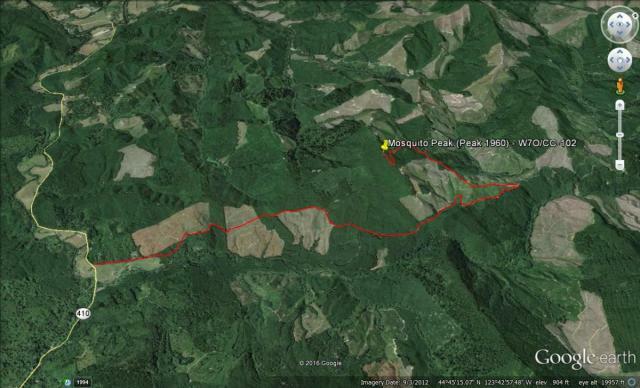 During hunting season this area is in the Alsea/Stott MT Travel Mangement area and is walk-in only. This will requrie about a mile hike. For more info see the Oregon Fish and Wildlife website.